This past Amazon Prime Day, I bought 20 Dash Buttons for $1 each with the intent to turn them into smart buttons so I can hijack them to turn on my AC, record work hours, and basically do whatever I want. 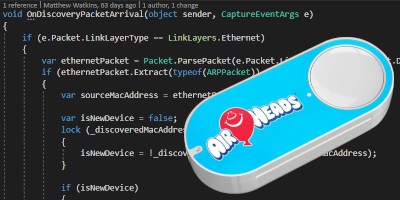 I liked Ted Benson’s article on hacking the Amazon Dash Button, but I wanted to play around with .NET Core anyways, and I want to add a management layer and share it with the world. So this project was born. This is currently running on my Raspberry Pi at home and works well. I’m using IFTTT as a web handler and have about 5 buttons hooked up so far. Push one and the A/C toggles on or off. Push another and you turn on a lamp. Push another and it sends a text. Push another and your phone starts ringing.